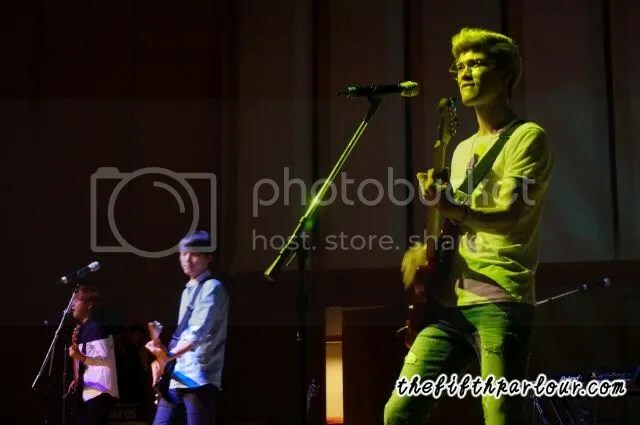 Nega Network’s talented trio boy band, LUNAFLY were back on our sunny shores for the third time earlier this month and as always, it was a carnival filled with great music, happy vibes and no doubt, fanservice galore for Lukies at LUNAFLY “From Us To You Fanmeeting”. Dressed in casual wear and equipped with their instruments on stage, the trio greeted screaming fans with their killer smiles and wasted no time as they went on to showcase their amazing vocals with their performance of “Yeowooya“. The fanmeet comprised of 3 main interactions games where participants were chosen personally by the band via a lucky draw and then called up on stage via a phone call made by the boys themselves. The first segment was Song Serenade in which fans were put in suspense as they await for a phone call that would grant them the opportunity of getting serenaded by each of the members to NSYNC’s “This I Promise You”. 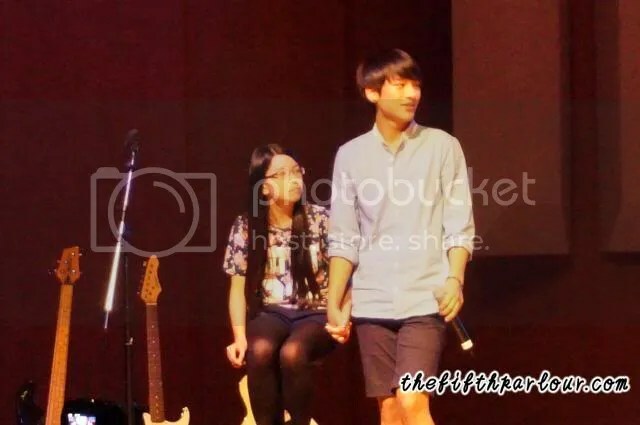 It was no doubt an intimate session for the lucky fans onstage as the boys held their hands with the lucky fans and gazed lovingly to them, leaving other fans yearning for the same experience. 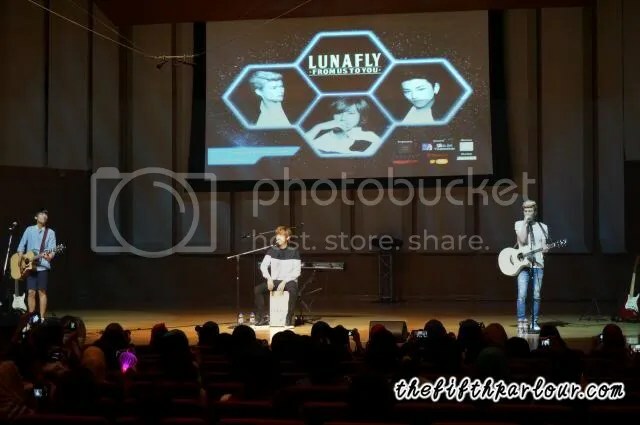 Following that, the band had the chance to show their artistic ability in “Drawing by LUNAFLY” event. Within 3 minutes, they had to draw something that is currently on their mind and gift it to 3 lucky fans. Leader Sam took the longest time while Teo finished first – completing his drawing under a minute. Youngest member, Yun drew a picture of the crowd – a picture that is beautiful to their eyes. Being the mood-maker of the team, Teo sent the crowd rolling in laughter as he explained his art piece which he dubbed as one-of-a-kind drawing. Essentially, he made references of colours with the world – Orange (Sun), Red (Fire), Green (Grass), Blue (Water), Black (Life) and people as the world in his drawing. At the end, fans collectively chose his art piece as the best out of the 3. Prior to the fanmeet, fans wrote their questions to the boys on post-it notes which were then personally read and answered by the band themselves during the fanmeet. The mood only got uphill as a video of fans learning to play the Cajun and performing it to the tunes of the band songs – “How nice it would be(루나플라이)”, “Superhero” and “One More Step” screened on stage, getting Teo especially hyped up and touched by their efforts. The last fan event was in collaboration with brand new local app, BlastOut. 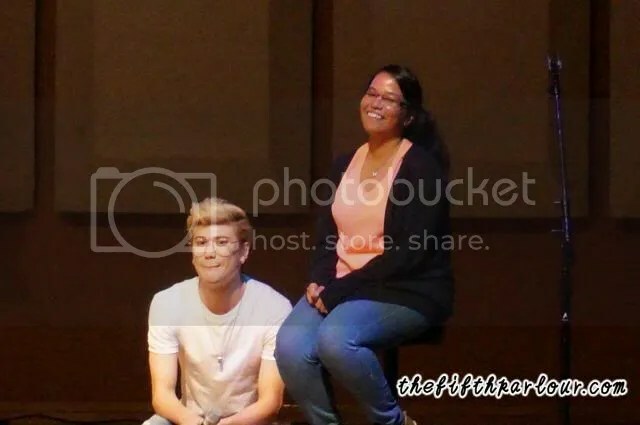 In this segment, fans had to upload their selfies and the boys would later on choose the most interesting picture to them and take a polaroid picture with the lucky fan. 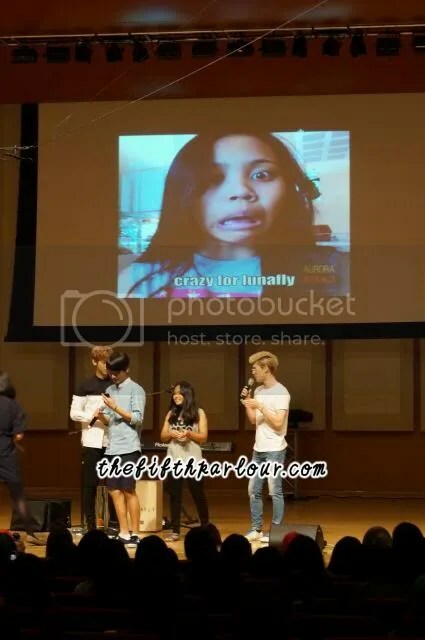 In the end, they chose a fan who took an unglam shot with the caption “crazy for lunafly” and even took a poloroid with the same pose! Before they ended the fanmeet with “Shake it Off”, they shared their thoughts of how great they feel every time they perform in Singapore. 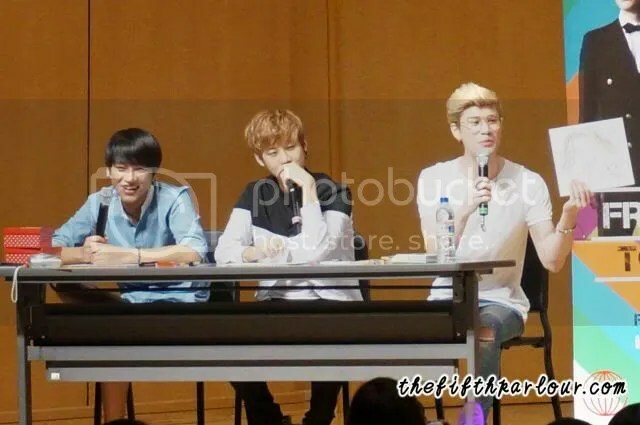 Different to their previous 2 visits in Singapore, it was a first time they had solely a fanmeeting event and hence, it felt weird for fans and the band to perform only 3 songs. The kind-hearted and down to earth nature of the band got fans falling deeper in love with them as they surprised fans with not only one but 2 more songs – “Seeing You or Missing You” and Justin Bieber’s “As Long as You Love Me”. Shortly after, they prepared for an interactive photo session and autograph session with premium pass holders and showered fans with hugs and laughters. 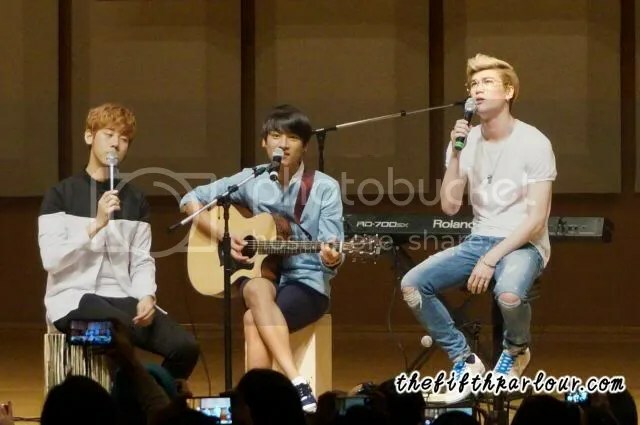 It is no doubt, always a fun and intimate time with LUNAFLY every time they perform in Singapore. 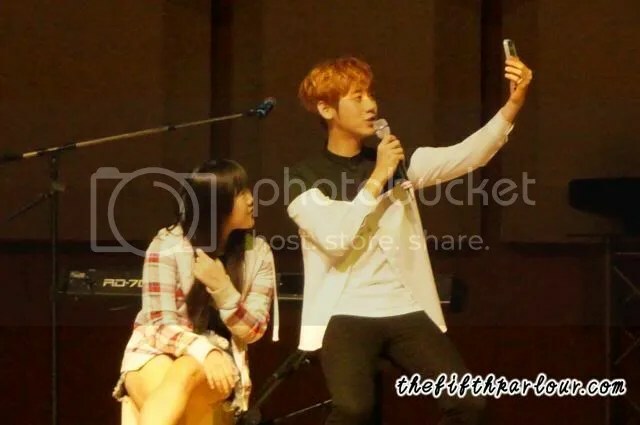 Showering fans with plenty of fanservice, giving them hugs and taking selcas of themselves on fans phones is not an unusual sight in an event with LUNAFLY. Thank you Aurora Borealis for the opportunity to do a coverage of the event!